It is widely acknowledged that the death knell for a sitcom produced in the USA is the adoption of a new child character into the cast’s fold. Whatever season he/she pops into — reason be damned — is destined to be one of the show’s last. Although the tasty moral crimes committed consistently throughout Hell Girl in season one (and happily expected of season two) only served to make my inner beast spread its depraved smile, I cannot describe the surprise of absolute and gripping horror which arrested the very palpitations of my heart when I saw a new hell correspondent child, Kikuri, debut in Hell Girl: Two Mirrors (HGTM). But Hell Girl is not an American sitcom, and, let’s face it, little children are creepy. So I continued to chapter skip through the 13-episode offering despite hearing bells in the distant background. Ignoring the ambiguity of said child’s presence, HGTM rolls along with the same premise instituted in the first season: people want revenge, go to a rumored website, and summon the hell correspondents to get rid of the antagonist. Unfortunately, the latter happens all too hastily and almost entirely without the surrealist imagination of the first series. Then the protagonists get a nifty tattoo to show that they are damned to hell for their decisive actions over which they’ve anguished. My main issue with season one was that the formula used in episode after episode — people pushed to the brink of sanity, upon which ledge they damn their tormentors and selves to hell — only began to be played with in terms of sequence and morality towards the very end of the series. HGTM definitely continues to play with sequencing and morality, but most of the time the attempts are gratuitous or superfluous. This time-trickery also does something far more detrimental to the series — it takes away the building of truly tormented characters that made the first season so much fun to watch and justified viewer sympathy. Of course the reason behind not getting to know many of the episodic characters in the first 13 stories of HGTM is to showcase their unjust or frivolous use of the hell correspondents. Such are the protagonists' motivations that, in the end, most feel totally unidentifiable or unsympathetic (sometimes more sympathy is felt for the hell correspondents for having to put up with such summoners, which is more the point). Maybe this is karmic retribution for their taking more active roles in season two (CSI: Hell on Earth) versus their behind-the-scenes role as divine sword of justice from season one, but either way the hell correspondents remain flat despite their foray into the spotlight, which only serves to make their attempted breakthrough naught but arduous viewing that detracts from the vignettes which make the series. 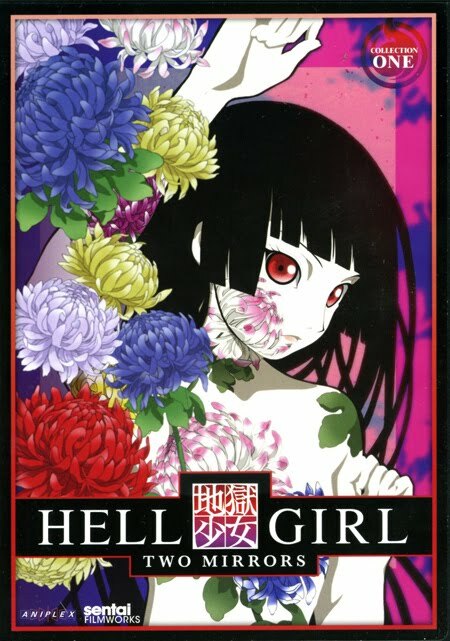 FUNimation picked up the original Hell Girl, and its failure to pick up the second season might be saying something. It definitely says there’s no dub support — a shame given the great dub of the first season. The Japanese voice cast is fantastic though, so there are no real audio drawbacks, and the background music is as divinely chosen as ever. Also, the original season one DVD releases came with a bunch of cool extras, including some live-action Hell Girl re-imaginings, but Sentai Filmworks’ Two Mirrors discs offer only the standard trailers and opening/closing credit options, an unfortunate choice given the new direction this season is obviously taking. Would director interviews or commentary really be too much to ask? Overall, I’d have to say this is worth checking out from Netflix or streaming. If nothing else, it highlights the merits of the original series by comparison and just might have something good going for itself somewhere further down the line. This review is based on the Sentai Filmworks DVD release of the series, purchased by the reviewer.